Berry’s music has been covered by an immense number of people over the years. The Rolling Stones were especially big fans of him. Their first single was actually a cover of his song Come On. One of the Voyager spacecraft launched by NASA in the 1970s features a recording of Berry’s Johnny B. Goode. It is the only rock song included in a recording to be hear by any life that may get in contact with the spacecraft. He was also among the first ten inductees in the Rock and Roll Hall of Fame when it opened in 1986. He joined many other icons like James Brown, Buddy Holly and Elvis Presley. 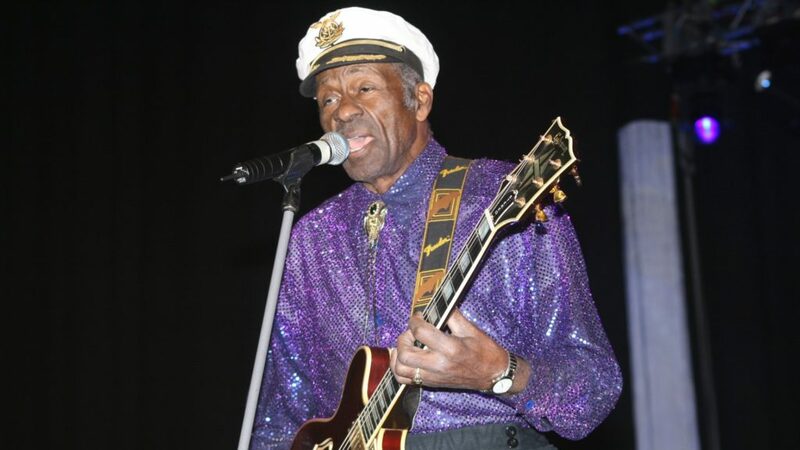 Chuck Berry continued to be active up until his recent death. He not only performed regularly at a club in St. Louis for years but he also planned a new album shortly before his death. That album will be released later in 2017. Here are ten of Chuck Berry’s greatest songs. Hail Hail the King of Rock and Roll! Is this the true anthem of rock music? This song about a young boy who grew up playing the guitar was loosely based on Berry’s own upbringing. The fast introduction, which was inspired by Louis Jordan’s Ain’t That Just Like a Woman, remains one of the most iconic riffs in music history. This song marks a true symbol of independence in rock and roll as a new generation was taking over. This was actually inspired by Berry’s life. His little sister Martha kept hogging the family piano as she wanted to practice her classical music skills on it. This was Berry’s first ever single. Designed off of Bob Wills’ swing hit Ida Red, Chuck introduced a fast guitar riff and lyrics about youth and having fun into the mix. This was critical in the overall development of rock music. Years before the Rolling Stones made a cover of this their first single, Chuck wrote this about a man who is down on his luck and can’t get anything going since he broke up with his girl. The witty lyrics are a true standout on this song. Martha Berry performs some backing vocals on this song. Berry went back to his memories of school for this song. The imagery painted about kids just waiting for school to let out for the day is truly vivid with plenty of clever wordplay. The song is a highlight of how Berry knew what his listeners were thinking. This heartbreaking song about a man who just wants to see a girl he cares for contains strong lyrics that Berry worked for nearly a month to perfect. The song also carries a great blues influence. It was particularly inspired by Muddy Waters’ Long Distance Operator. Berry’s sense of humor is on display in this song about a fun joyride gone awry. The upbeat guitar style creates a good vision of the road. The fun nature of the song makes it a classic to this day. The bass line on this song is especially memorable as the bassist manages to keep up with Berry’s fast playing. Unfortunately, the identity of the person who performed that part has been lost to time. This song is best known for having been loosely parodied by the Beatles on their White Album. The fast and fun style of the original song is still there just like they were in the Beatles’ track. Berry’s visions of America especially add a memorable feeling. The song would become a hit again a few years later when it was covered by Linda Ronstadt. This early single was powerful and featured a great guitar beat that kept on chugging all the way through. The energy of Berry’s performances can be felt in this song. Of course, it is also famous for having inspired some of the lyrics of the Beatles’ Come Together. This last song was inspired by a trip across the country and the strife that Berry often experienced. He wrote this song while in jail after being arrested for violating the Mann Act. The song shows that even in the toughest times there are always people out there who care for him and others.